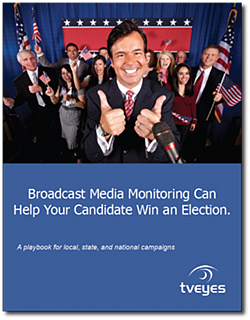 Help Your Candidate Win the Election with Broadcast Media Monitoring from TVEyes. Playbook for national, state and local elections shows you how broadcast intelligence can help you win the battle for media supremacy. The 24/7 news cycle can be your friend or Achille's heel. With TV monitoring, you can have a better prepared campaign and candidate.